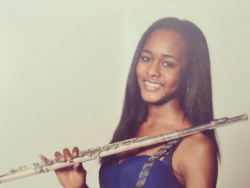 Davinya first started the flute aged 9, where she was taught by Sahana Gero up until the age of 11. In 2007 at the age of 11, Davinya was awarded a Music Scholarship to study at St. Cecelia’s School in Southfields, Wandsworth. She was then awarded another scholarship to study on a Saturday programme at The centre for Young Musicians in Waterloo. Davinya played with The London Youth Wind Band for 3 years and the 51st State Band for 4 years and performed at The Putney Art’s Centre. In 2009 she was awarded a full scholarship worth £32,000 p/y to study at one of the most prestigious music schools in the world, The Purcell School. She was under the tuition of Anna Pope (flute) and Daniel King Smith (Piano). Whilst studying there she became part of The Purcell School Symphony Orchestra and Performed at The Royal Festival Hall, The Queen Elizabeth Hall and Watford Colosseum. In 2011 Davinya appeared on the ITV Programme ‘Born to Shine’ as part of a chamber group. She also performed at The Barbican With the Barbican Youth Orchestra in 2012. In September 2013 Davinya gave a solo recital at The Wigmore Hall. During her time at The Purcell School she became involved in outreach projects, going around local schools in Hertfordshire teaching and influencing young children to get into classical music. She has won many musical competitions and have taken part in a variety of music festivals and has performed at weddings and a funeral. In September 2014 Davinya gained a place at The Trinity Laban Conservatoire of Music and Dance where she is under the tuition of Susan Milan, previously taught by Anna Noakes, (Classical) and Mick Foster (Jazz). She has participated and performed in masterclasses to Paul Edmund Davies and Wissam Boustany. During her time at Trinity she has played with The Trinity Laban Symphony Orchestra playing principle flute at The Blackheath Halls in December 2015. Davinya has also branched into Jazz, performing at The Clore Ballroom Floor at the Southbank Centre with Trinity’s Contemporary Jazz Ensemble for the London Jazz Festival in November 2015. In February 2016 she also performed at The Ronnie Scott’s Jazz Club with the Contemporary Jazz Ensemble. In February she reached the Semi- Final of the Harold Clarke Woodwind Competition 2016. Davinya had the honour to perform with Simone Leigh and Rashida Bumbray for Rashida's exhibition at the Tate Modern 26th November 2016. She perforned at The London Jazz Festival with Trinity Laban Contemporary Jazz Ensemble December 2017 and lead a workshop representing the Chineke Orchestra with kids in Southampton. Recently performed with Jazz musicians Trevor Watkis and Bryon Wallen on a project that combined literature and music in February 2018. She also performed with The Trinity Contemporary Jazz Ensemble for the London Jazz Festival and at Ronnie Scott's Jazz Club 2018. Taught in Outreach Projects in Schools. 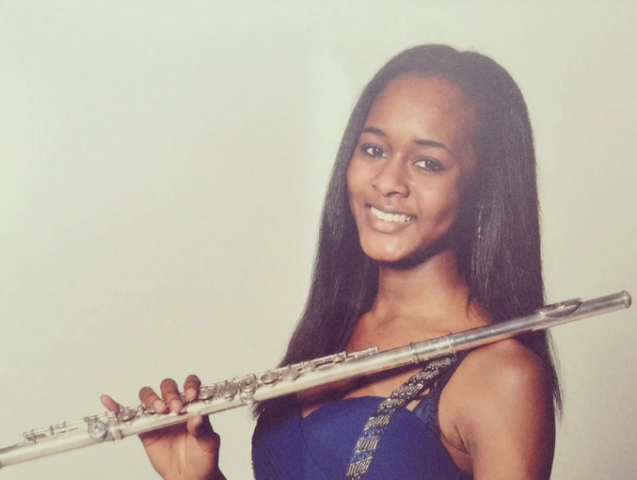 Davinya is passionate about teaching as she feels its essential to pass on the knowledge that she's been taught and believes this is is a key part to becoming a great flautist and a well rounded musician. Learning isn't just for the student, but for the teacher. Each individual brings something special and new to performing. Her aim is not to make each pupil sound the same, but to support and encourage their unique differences. Davinya is an innovative and energetic teacher who is reliable, friendly and professional at all times. Her main aim is to make sure the lessons are fun, enjoyable and inspiring. She believes jazz is also important to being a diverse musician, therefore she is happy to introduce improvisation and theory to the lessons so the student is able to have a wide range of abilities. She is able to teach from home and is also available to travel.